Smooth, rich and creamy. 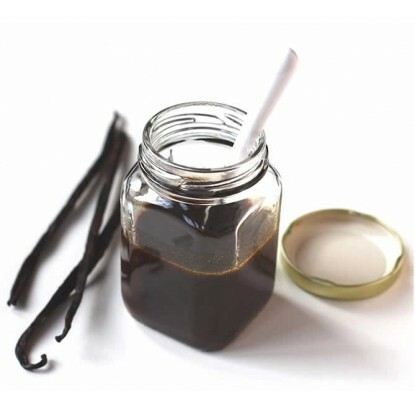 Vanilla paste is pure vanilla with bits of natural vanilla bean seeds in a unique, convenient, paste form that adds a gourmet appearance to any recipe. Ingredients: Pure Vanilla Extractives, Sugar, Alcohol, Water, Vanilla Bean Specs, Xanthan Gum (a natural thickener). Use vanilla bean paste in place of vanilla extract anywhere you want the beans to shine use vanilla bean in icing, frostings, puddings, custards, gelato, crème brûlée, whipped cream, butter, pound cakes, ice cream, sauces like creme anglaise and sabayon. Vanilla bean paste is also ideal for savory sauces as well. Vanilla extracts, whole beans, pastes and powders should be stored in an airtight container at room temperature and away from direct heat and sunlight. Don't put in the refrigerator or freezer. 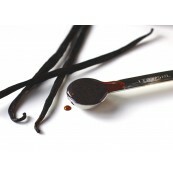 For extracts, refrigeration or freezing will speed up the natural separation of the vanilla essence from the liquid base. For vanilla beans, refrigeration can quicken the growth of mold.